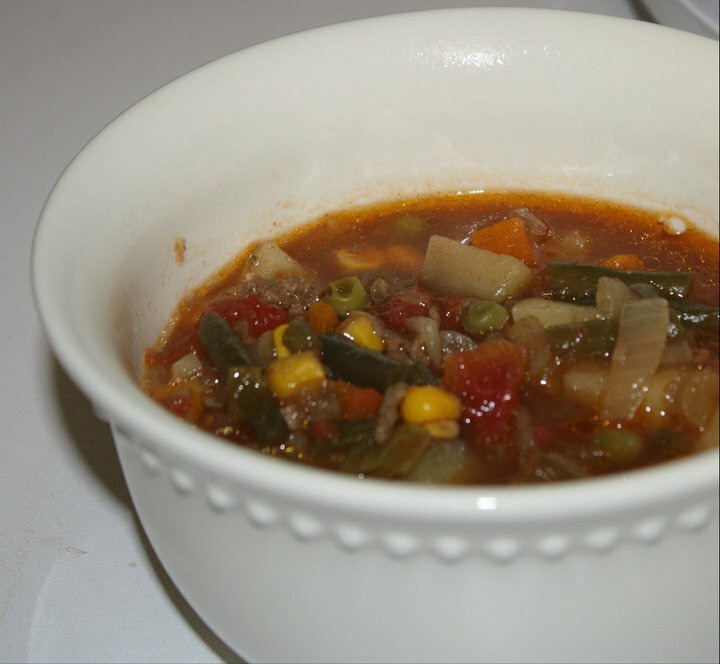 Little Mrs. Married: Hamburger Veggie Soup - in the crockpot! For the entire month of January I have been taking soup to work for lunch. I usually hate canned soup...they have some sort of aftertaste that i do not like. But i have found that Progresso's soups are good & do not have that yucky aftertaste. I love the Chicken & Wild Rice one. SO GOOD. Week before last i started getting sick of soup for lunch. It was getting too warm. But last week the temps dropped a good bit. COLD. And WET. When they started announcing lots of "freezing rain" (I don't know why that is funny to me) & school/office closures, i decided i MUST make some soup. Homemade soup is just the best & SO easy to make! As soon as work let us leave last Thursday, i ran to walmart & grabbed some stuff! Work was canceled Friday due to the weather. I didn't know how bad it would be & if i'd be able to get out & get groceries! It didn't snow, or even sleet, but it was cold & rainy. Perfect day for crockpot soup!! I randomly found this recipe here & adapted it just a little. It was perfect just like this & SUPER easy! Brad had 3 bowls...ha! Throw it all in the crockpot. I had mine set on low for 8 hours, but it was ready at 7. Notes: The original recipe didn't have potatoes & only used 1/2 pound beef. The mixed veggies included green beans, carrots, peas & corn, i believe. Also, i would have used lean ground beef but walmart was OUT! Crazy! SO ground chuck it was. If you're trying to be healthy just know that lean ground beef is perfectly fine! You could also use ground turkey. :) I do that sometimes too, but i wanted beef tonight! Haha. Looks fantastic for a chilly day. Looks great! I love soup in the winter!